Reviewing dance often feels to me like trying to explain a joke. If you break it down into its component parts, it’s not the same. I could try to describe for you what happens onstage in Tamara Ober’s first multi-person piece of choreography in Present State Movement’s Of Something Human. Lord knows I scribbled pages of notes in the dark as it went along, trying to split the difference between not taking my eyes off the performers for a second, and not wanting the handwriting to be a completely jumbled mess. But words honestly don’t do Of Something Human justice. You need to see it, take it in for yourself, and get that emotional response that eludes language. And I enthusiastically recommend you do. To give the whole thing a little context, normally Tamara Ober is doing the dancing herself, creating and performing beautiful and compelling solo dance pieces like Standing On The Hollow (Fringe 2013) and Sin Eater (Fringe 2012), or pulling together dancer showcases like Flesh (Fringe 2011). Some injuries have sidelined her temporarily as a dancer (as evidenced by a rather forbidding looking sling/immobilizer for her arm visible at curtain call), so she turned her talents to creating choreography for other dancers for this year’s Fringe. 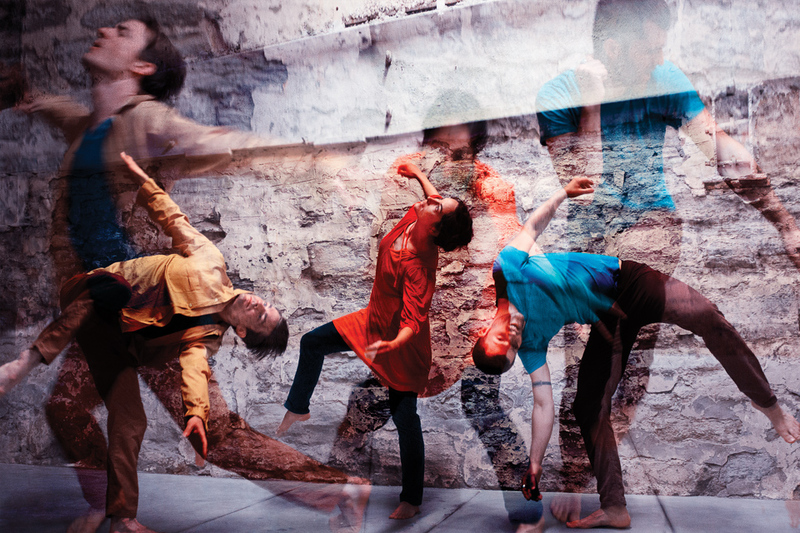 The trio of dancer/collaborators in Of Something Human - Leslie O’Neill, Timmy Wagner and Dustin Haug - are amazing. Tamara is also working again with video designer D.J. Mendel, providing visuals that are astonishing. This dance/film work is the explosion and collision of humanity through time and space, war and peace, order and chaos, as it struggles to find moments of cohesion and intimacy in human skin. - is probably the most succinct way of getting to the nugget of this piece. There’s also a video profile of the work in development that can give you a taste. But it’s the dancers and the Mendel’s video work together in performance that defy easy summary. Suffice it to say that words like gorgeous, lyrical, and graceful feel like understatements. The video goes back and forth between evocative use of black and white, and color. Images that seem like photo-negative documentation of the dancers in motion give way to periods of rain and smoke, soldiers and fireworks, stars and the earth as seen from space. The rolling countryside, a hot unforgiving sun, and the more comforting illumination of candlelight. The sound of the dancers’ own voices live in the space are overtaken by snippets of news coverage, switching the stations between a cacophony of viewpoints. The dancers themselves start off isolated, then in conflict. Slowly, however, they peel away the layers of their costumes to reveal a final layer that makes them seem more similar than different. The physical stresses of conflict and news coverage fade into more caring, loving and intimate interactions. Finally smiles emerge and banish violence. A threeway embrace toward the end seems both sensual and simply comforting. Blah, blah, blah. Words don’t equal dance. Seriously, just go and see Of Something Human. If you’ve seen Ober’s previous work, you know the kind of world you may be entering. If you haven’t, this is a chance to see her mind made manifest in the movement of others, which is also a singular treat for the eyes. This isn’t your average generic dance show. This is dance with a distinctive point of view. It’s a way to exercise your brain and your humanity in a way that words spoken or sung on stage do not.